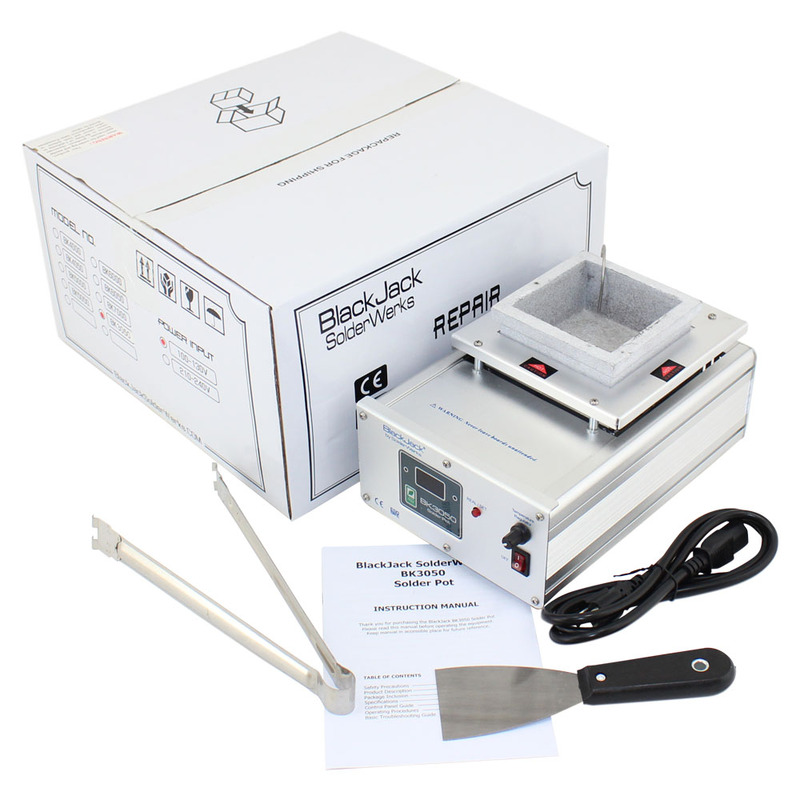 The BlackJack SolderWerks BK3050 Solder Pot is a durable, general purpose solder pot. It is an appropriate selection for traditional solder containing lead and also for lead free solder. 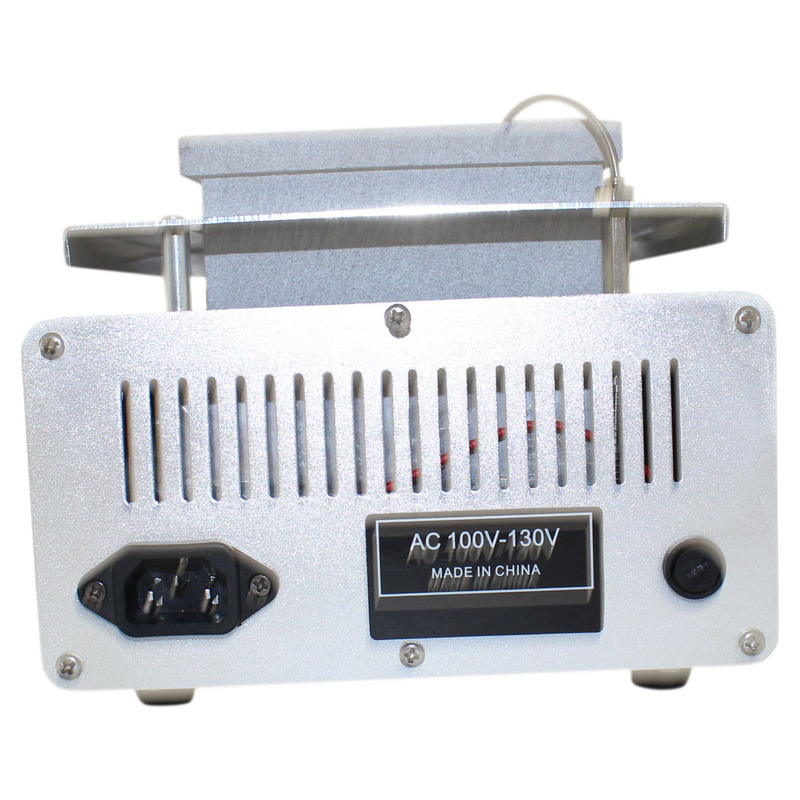 This solder pot implements high power Infra Red (IR) heating technology for fast heat up and stable temperatures. There is an external sensor that feeds back actual temperature for precise temperature control. 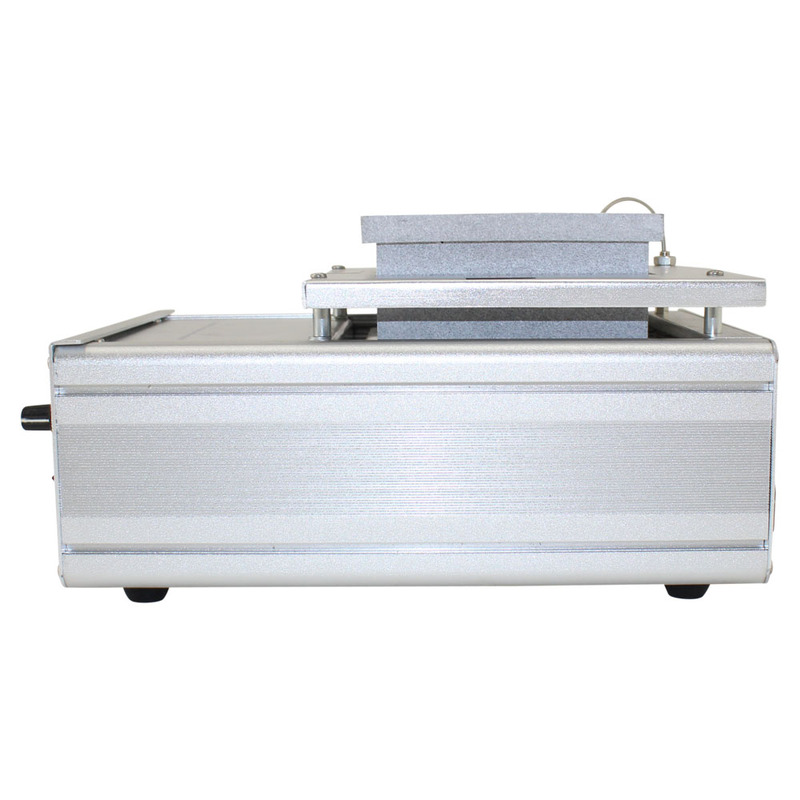 As with all BlackJack soldering equipment products, this unit is ruggedly constructed from extruded aluminum and gives the unit an appropriate high tech look. Unlike many low cost solder pots. This unit features a ceramic solder crucible. 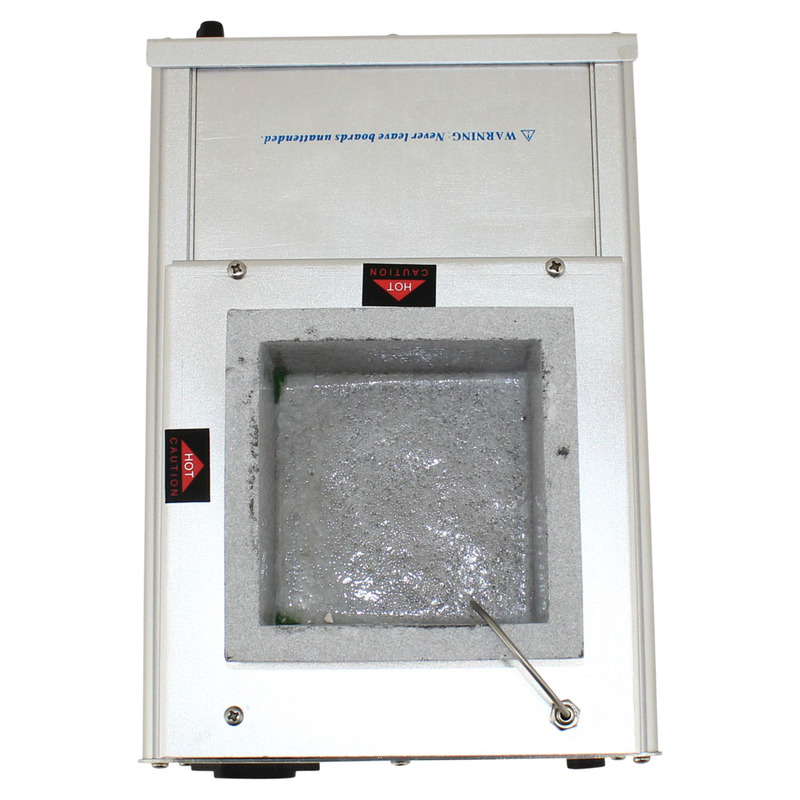 The BK3050 Solder Pot features a Digital Display for temperature display and a Temperature Regulator system. 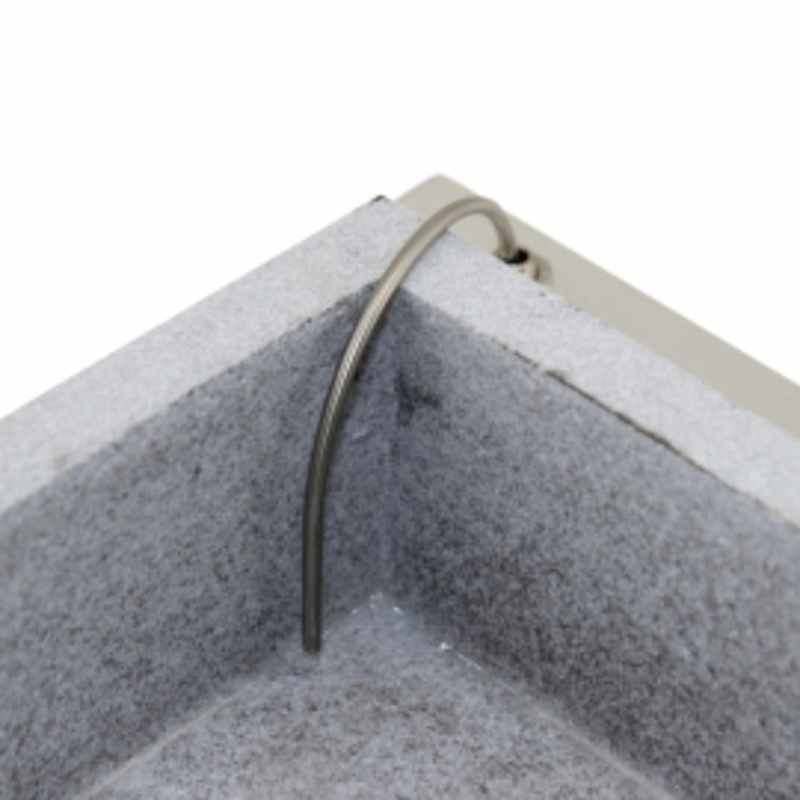 The BK486 Smoke absorber makes a great addition to the BK3050. Click on the image below for our Tech Guru's, George Leger, demo on removing a multi-pin connector using the BK3050. 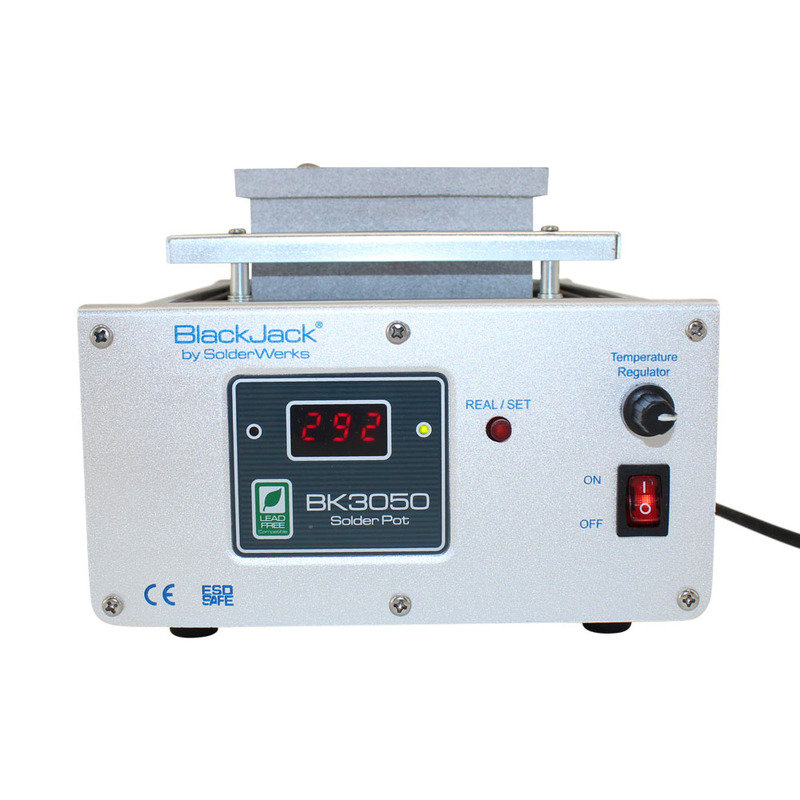 The BK3050 takes approximately 7 pounds of solder to fill. [Continued from above).. 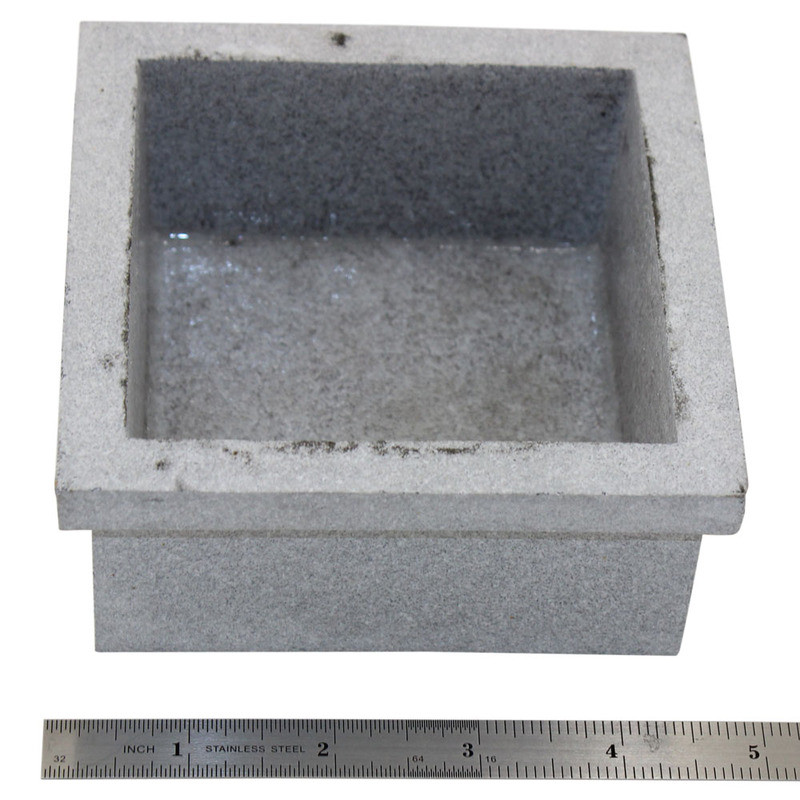 The solder pot should be rectangular or square. 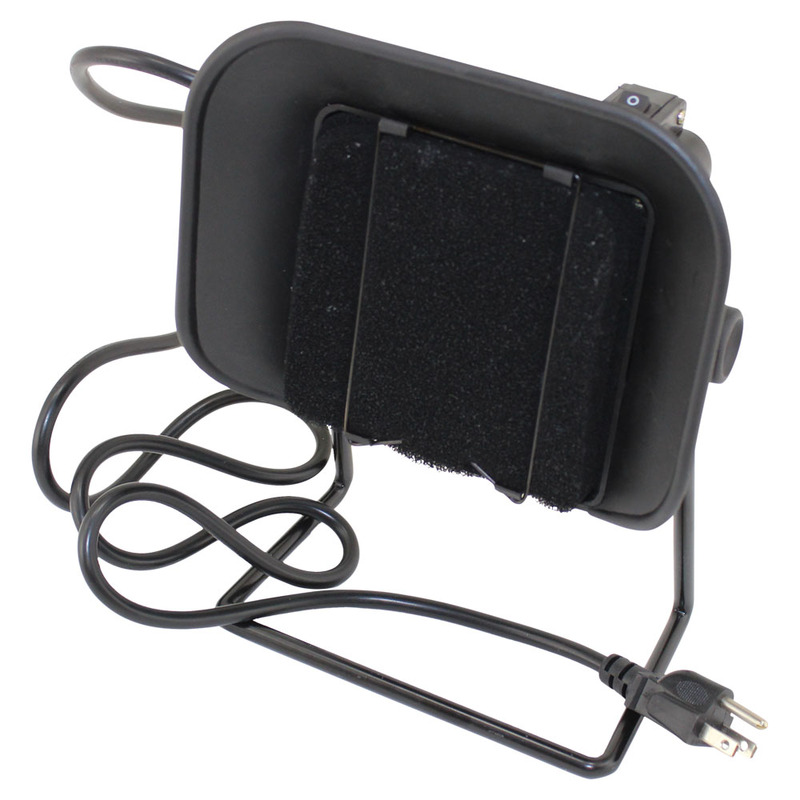 Usually, larger solder pots mean higher costs but we recommend getting one as large as you can afford. First thing to do is to turn the unit on and then adjust the heat controller to units maximum setting. Then add your bar solder to the pot. Keep adding solder until you have molten solder mounding up above the edge of the pot, almost as if the solder is about to spill over the edges. Once you have accomplished this, you may adjust the temperature to the desired level. Thats why a good feedback temperature regulation system is important. 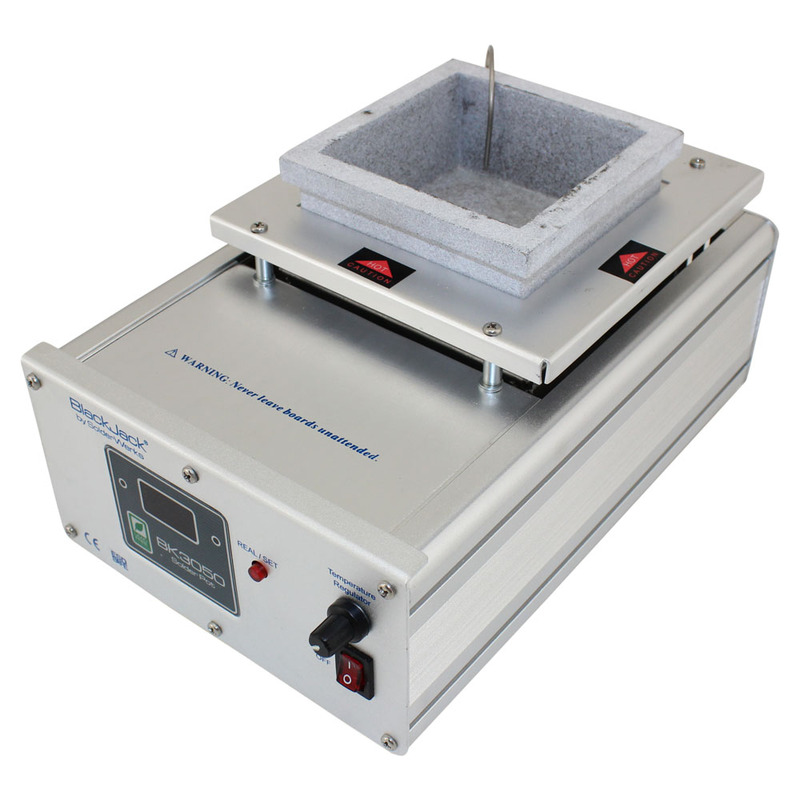 You melt the bar solder on max to get the pot full then set your temperature again for optimum performance. Keeping this optimum temperature (usually about 500°F/260°C) stable and accurate is the important part of a well designed solder pot system. If the temperature fluctuates all over the place, your results are likely to also fluctuate all over the place. When your solder is finally molten, there may be a dull or corroded look to the surface. This is called DROSS. You should lightly scrape the dross off of the surface with the edge of a piece of paper, a straight edge etc. This should leave the surface looking bright and shiny. You may have to add more solder if the level is below or even with the lip of the pot. The idea is to have the level brimming. This will be easier to accomplish if the surface you have your solder pot situated on is as level as possible. 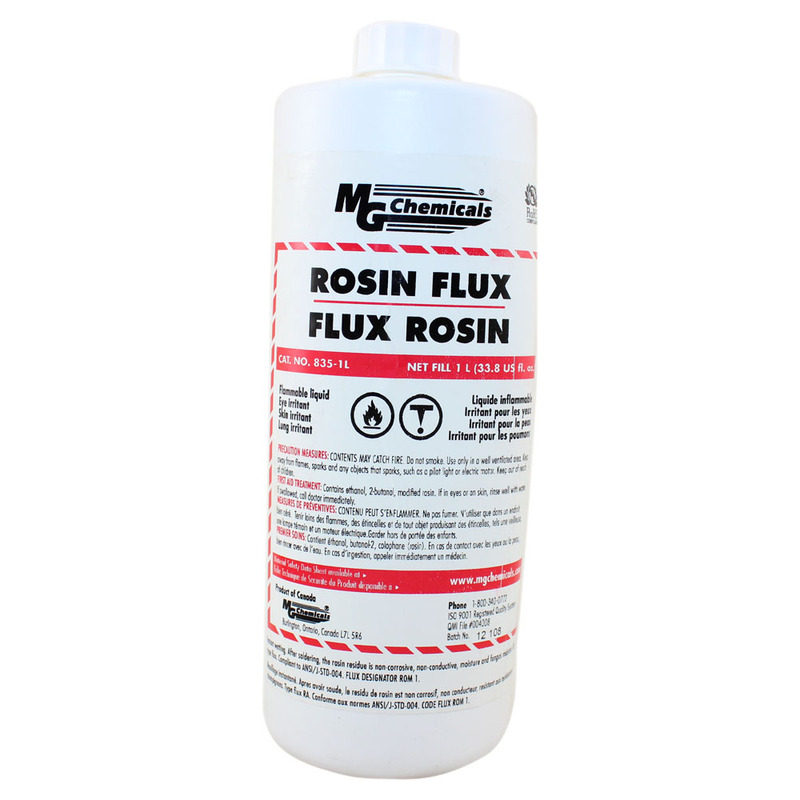 Next, in a separate glass tray, pour some liquid rosin no clean solder flux (We use MG Chemicals ITEM 835-1L or 835-4L). About 1/4” depth is fine. Once you have the liquid flux ready, place it next to the solder pot. Now you are ready to solder the Printed Circuit Board. The first thing to do is make sure all of leads from the parts you are soldering are trimmed to less than 3/16 “ but no less than 1/16”. Also check to make sure that the copper PCB pads on your board are shiny and clear of any contaminant or corrosion. 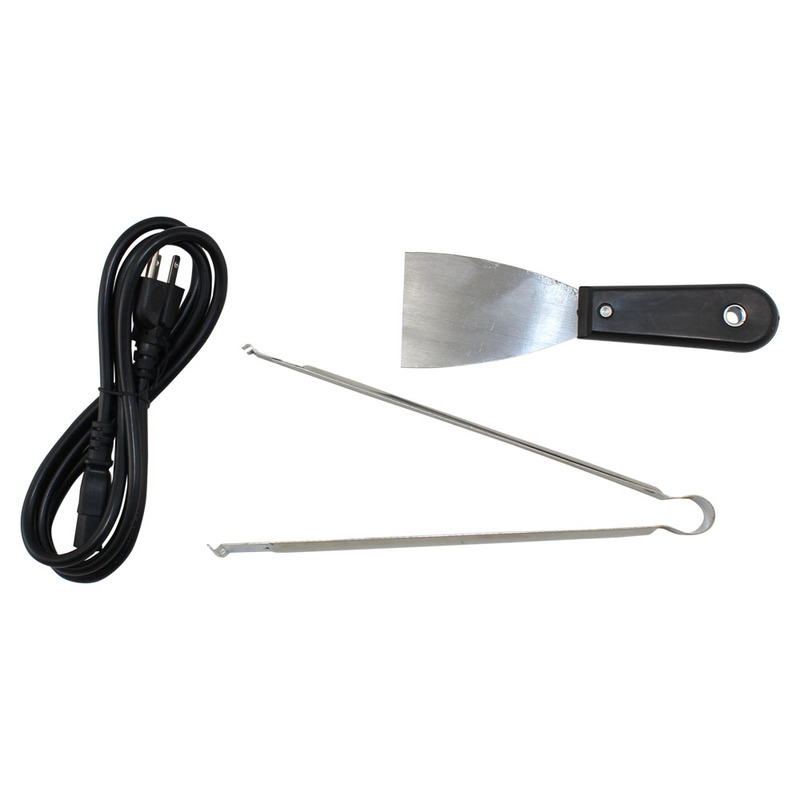 Then, take a pair of stainless steel tongs (often included when you buy a solder pot) and pick the PCB up by the sides. Then, lightly skim the bottom of the Printed Circuit Board onto the surface of the liquid flux just enough to wet the entire bottom surface of the PCB. If you accidentally get some flux on top of the board, it should be o-k but it does waste flux and will have some cosmetic consequences later. The next step is to skim the PCB in a flat orientation over the molten solder surface. Do this slowly & take about 4 to 6 seconds to make the pass. If you are using a board that is wider than your solder pot, you can make several passes and cover the board surace in strips but try not to overlap on the passes to too much. The next step is to hold the PCB using the tongues as still as possible. Its best to do this over a sheet of aluminum foil. After several seconds, the solder will have dried enough where you wont have to be so still. Being still is important because any parts that move while the solder is still liquid will increase the chance of having one or more bad solder joints. Wait for about 30 seconds and then carefully examine the bottom of the board. You are visually looking for any bad solder joints. If you have 1 or 2 bad joints, you may wish to repair them using a regular soldering iron or soldering station. If there are a lot of bad solder joints then check the rosin level in the tray and especially the temperature of the solder. Then run you circuit board through the same process again & see if your results have improved. After a few attempts and assuming you're solder temperature is in a good range, you should be able to complete the soldering process without seeing many, if any, bad solder joints. After you do a few boards, you probably will have to add some more solder and perhaps some more liquid flux. Wait a few minutes after you add solder so that the temperature can come back up. You may find it necessary to skim the dross off again if you added a lot of solder. Remember, temperature is very important to get good results with a solder pot. When using 63/37 solder, we run the temperature at about 260 degrees celsius. Soldering is a smelly business. If you do a lot of it, a vented fume hood may be in order. At the very least least use a fan to draw the fumes away from from the operator and any others in the area. Many fan assemblies with carbon filters are available. They are relatively inexpensive. When you are finished, wash your hands thoroughly (or consider using rubber gloves), Failure to do so can lead to bits of lead and other contaminants ending up in your food or elsewhere. Liquid Rosin Flux - 33 oz. 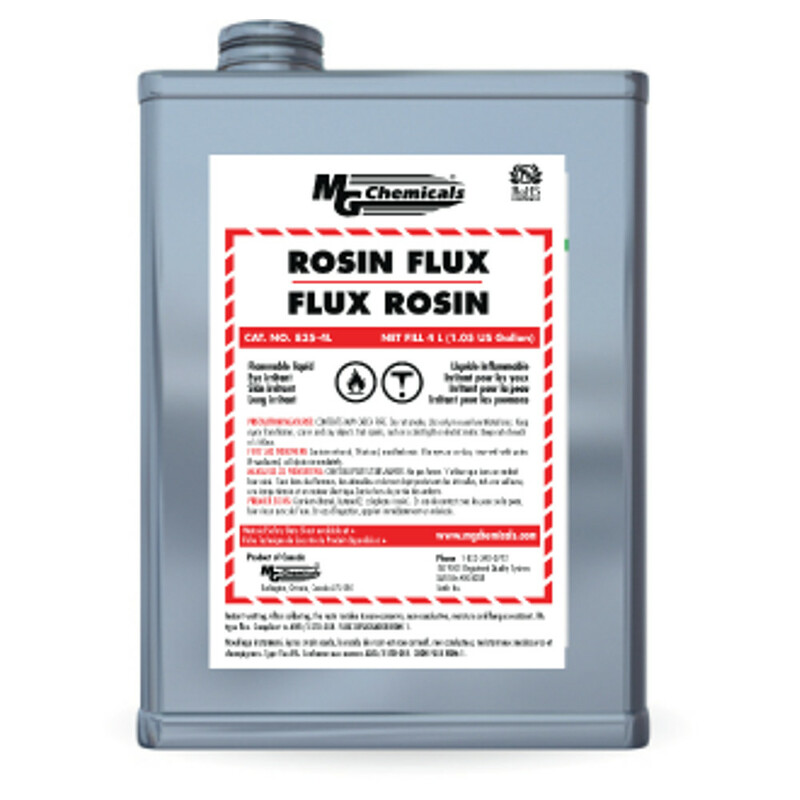 Liquid Rosin Flux - 1 gal.